This week on the show David and I speak live with Blackfive correspondent LTC Steve Russell, who along with JD Johannes and TIME’s Brian Bennett have spent the last two weeks in Iraq reporting on current conditions. Steve spoke w/ Gen. Odierno who commanded his division during his previous combat tour, as well as the LT Governor of Diyala and many others. There is a rough cut video of some time spent w/ US and Iraqi forces out in town. We also have TSO on for a segment and unveil a new adjunct to the hugely popular “Ask an Infantryman” with our “Ask a Pastor” segment w/ David’s older brother Daniel. That and a ton and I mean a ton of Murtha bashing. Here are the podcast of the show and the video of LTC Russell out on the town. 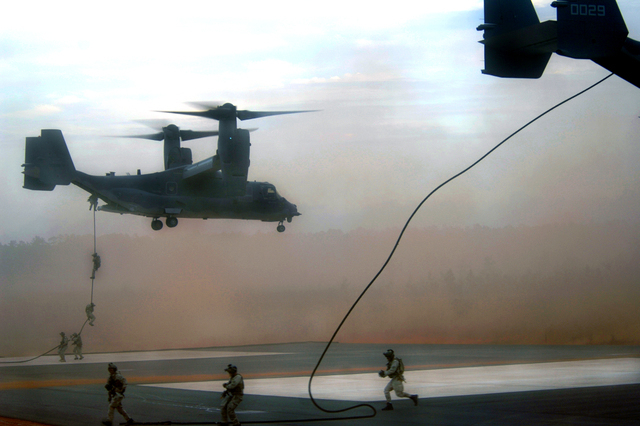 U.S. Army Special Forces members disembark from a CV-22 Osprey aircraft during a fast-roping demonstration on Hurlburt Field, Fla., Oct. 22, 2008. The simulation provided members of Congress with a realistic view of special operation missions during a tour of the base. U.S. Air Force photo by Senior Airman Sheila DeVera. I came across this video and just had to share it. It compares and contrasts the USS Reagan with the new USS Clinton and USS Obama. Enjoy. I really don't have anything else to say about the war, that this young gent hasn't said better, in fewer words, and with more conviction and commitment than 99% of us could ever muster. Oh Well, the other Navy guy beat me to it. This is part of a series of interviews sponsored by Baen Books with some of today's top military science fiction writers. Links from here point to Amazon for those who want paper copies, while links at Baen point to their electronic webscription service. Part 9 covers Honor Harrington, and how -- despite what some may say -- the series is not about the military. What is it about? Well, listen and find out. The subject of blogs, milblogs and a most interesting thought about responsible voting and responsible political decision making comes up towards the end. Discussion of David Weber usually begins with a very good quetion: Where to start? Should you start with the first book in his hugely popular Honor Harrington series? Or should it be with the first book in his fantasy series where the god of war is also the god of justice? Perhaps his Empire from the Ashes series? Hmmm, wait, maybe the first book in his latest series? Or the first book with Linda Evans in the Hell's Gate series? His first collaboration with Eric Flint in the hugely popular 1632 series? No, no, no, wait -- his first book in collaboration with John Ringo in the Empire of Man series? Maybe his work in the Bolo universe of Keith Laumer? Ultimately, it really doesn't matter where you start. No matter what you choose, you will be starting a good book and quite likely a good series. Almost no matter your taste, there is a book or series by David Weber that is likely to appeal to you. His work on combat, battle, and some of what lies beneath is recognized and highly praised for its accuracy -- yet, David Weber has never served in uniform or in combat. Some of his work in the Honor Harrington series has even been used in class discussion(s?) on military leadership. David's works explore that which lies behind leadership, justice, and loyalty. This series of interviews will explore a bit of that which lies behind his explorations of what lies behind, and with a certain amount of detail as he was kind enough to give Blackfive TV almost two hours of his time. Part 8 can be found here. Part 10 can be found here. I watched the PBS show The War Briefing and while the first 5 minutes or so had the usual suspects, it leveled out and was a decent look at the Afghan/Pakistan war. And yes that is absolutely the right way to describe it. The opening quote from a talking brain set the tone as she led with "Took their eye off the ball" i.e. W screwed the pooch by invading Iraq instead of fixing the never been fixed ever Waziristan. They led with 5 or 6 smart pantses hammering the US and speaking of the US as they instead of we, which is telling. But they did have Kilcullen and Nagl and even a dose of Jack Keane so you have to give credit. Historically you can see what Roggio has to say, from a bias perspective it was relatively fair, for PBS I mean. Courtesy of the Jawa's, I found out today that the Navy is naming it's newest destroyer, the second Zumwalt class destroyer built, for Michael Monsoor. For more on Michael Monsoor, please see here and here. Sup. Uber Pig here. Need some help. A family friend is getting ready to join the Marine Corps. For some reason, his recruiter says he can't promise him a bonus, but he's going to everything he can to get him one. Unfortunately, he will only know what the bonus is, if there is a bonus at all, after my family friend has enlisted. I'm a little worried because at that point it's too late, as most of you with prior service already know. This is a good kid, though. I told him to make his decision based on no bonus, though there appears to be an attractive package of college money & educational benefits worth in the vicinity of $80k -- enough to pay for college. So if you are a Marine Corps Recruiter, or you know a Marine Corps Recruiter you trust and are willing to vouch for, please hit me up at enlisted swine at the G. Or in the comments below. I forgot what a debacle I had left behind in Madison. All my stuff is just piled up in Kev's hooch and I am a homeless vet. My chores delayed the departure for PA and the Murthapalooza until tomorrow, but God gave us a brilliant day to make up for it. 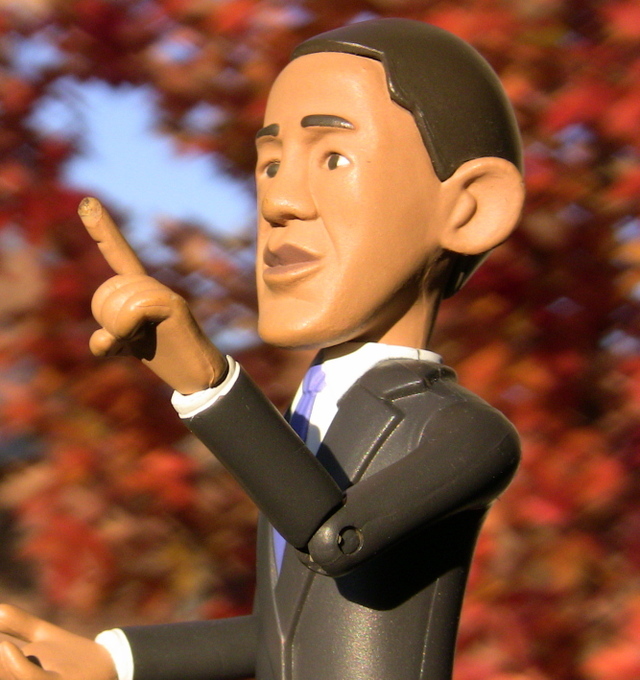 I took my compatriot The Obama on a trip to some of my favorite Mad City sights. My guy shares only one name with the Presidential candidate, he is kind of an anti-BHO. Tough to top his adventures on my birthday, but good fun anyhow.